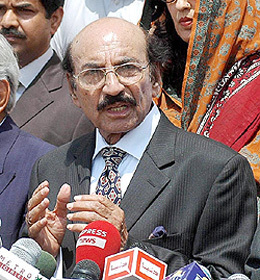 Gaddap Town residents have been suffering an acute water shortage and despite Sindh Chief Minister Syed Qaim Ali Shah taking serious notice of the issue, a large number of helpless villagers continue to be deprived of one of life’s most crucial necessities due to a combination of negligence as well as corruption, The News has learnt. A Gadap Town official, on the condition of anonymity, told The News that Shah sent out an official inquiry to the town’s administration and the Karachi Water and Sewerage Board (KW&SB) and requested that officials submit a report on why the people are unable to access water. He also revealed that KW&SB responded to the CM’s letter, claiming that the board was responsible for providing water connections to respective areas as per suggestions and schemes, but the town administration was the authority that was liable to ensure proper distribution as well as maintain the various facilities in its jurisdiction. The Sindh government has already issued directives to the town administrations of Karachi’s suburbs to launch development schemes. According to certain sources within the town, more funds were allocated for the purpose of these projects; however, these schemes have yet to materialize and the money is not accounted for. A local activist alleged that the town administrator sent out false information in a report in this regard. “The town administrator has justified the persistent water shortage with the excuse that water facilities in some areas were not functioning properly due to power failure. He alleged that aside from the latter technical problem, all the areas’s residents had no complaints regarding water supply,” he said. Other local activists claimed that certain town officials had engaged water tanker operators in supplying water to profitable localities like private firms and poultry farms. According to them, 12 water tankers were mandated to supply water to remote villages where underground water was contaminated. However, they revealed that half of them were either abandoned at the town office due to some technical faults that have yet to be repaired, or were being utilised for corrupt purposes. Residents of remote villages do not have proper access to water and in the absence of water tankers; women have to suffer the strenuous journey to the nearest facility twice a day. They added that water facilities developed by the town administration as well as the now defunct district council of Karachi were being neglected. The News was told that that many villages were deprived of operational water facilities, including Waja Ibrahim, Hussain Bux Baloch, Allah Bux Jokhio and six other villages in Union Council Darsano Chano; all of which were facing an acute water shortage for the last two months because hand pumps and deep-drilling wells were not functioning properly in their respective localities. After receiving endless complaints from residents, Town Administrator Ashfaq Mallah had convened a meeting with water tanker suppliers and local activists on Monday to discuss how to resolve the issue as well as monitor water tankers to ensure that no corruption was taking place. Mallah warned that strict action would be taken against drivers who were not honestly fulfilling their responsibilities, sources said. However, he failed to respond to The News despite several attempts.